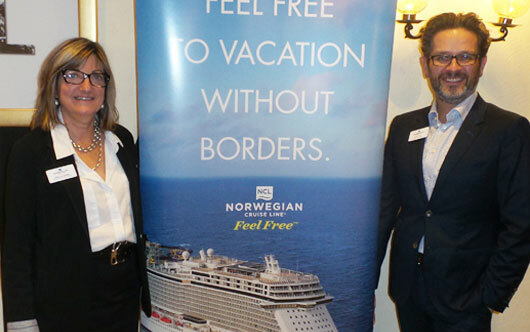 Norwegian Cruise Line (NCL) recently held agent training sessions to keep the trade informed on all that’s new at the cruise line, including its upcoming 2019 season. The program will see the return of Norwegian Bliss to Seattle on May 5 for its second Alaska season. Bliss will be joined by Norwegian Joy sailing from Seattle and Norwegian Jewel cruising from Vancouver and Seward, Alaska. Pictured from the NCL team are Mary Jo Cutaia, business development manager, and Derek Lloyd, national director of sales, Canada.